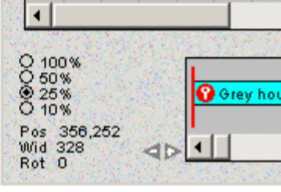 Figure 5 shows the detail from the ISMC screen that contains the Window Status Area. This area indicates the zoom status of the Stage, the horizontal and vertical position of the center of the Camera Window, the current width of the Camera Window and its rotation angle. The zoom status of the Stage is shown as a selected value in a button list. The zoom may be set at 100%, 50%,25% or 10% by clicking the appropriate labeled field. The Zoom In and Zoom Out selections found under the View Menu also control the Stage zoom. The status indicators in the Window Status Area indicate zoom changes made through the View Menu as they are made. Two small triangles, one containing a “+” the other a “-” located next to the Timeline are used to control the zoom factor (time scale) of the Time line. Clicking on the “+” arrow expands the Timeline while clicking on the “-“ contracts it. These controls are duplicated by Expand Timeline and Contract Timeline found under the View Menu.